Make 24 little origami baskets, using scraps of Christmas gift wrap or origami paper, and fill each one with something special. Use our ideas for filling your home-made advent calendars for inspiration. Hang them in a line on a piece of yarn strung across the room, or even from the branches of your Christmas tree. 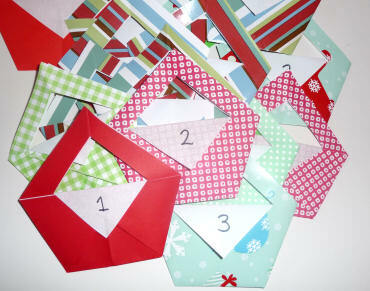 These origami envelopes are quick to fold and you can make an impressive advent calendar quickly. Either use up scraps of Christmas gift wrap randomly, or choose your paper carefully to blend in with your Christmas decor! This origami advent calendar is made by folding 24 little origami cones, flattening them, and tying them closed with a ribbon. 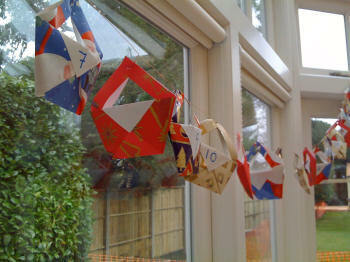 This is a very simple origami star which even the youngest children can make. As you will need three squares of paper and a glue stick to complete the model, it isn't origami in the true sense!